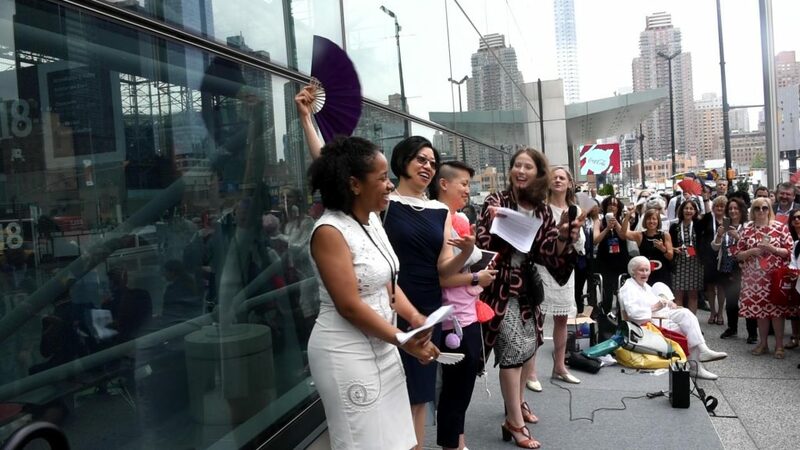 “This is what a feminist looks like,” chanted a lively and diverse crowd of architects and designers, who joined the Voices of Plurality flash mob outside the AIA conference in midtown Manhattan. 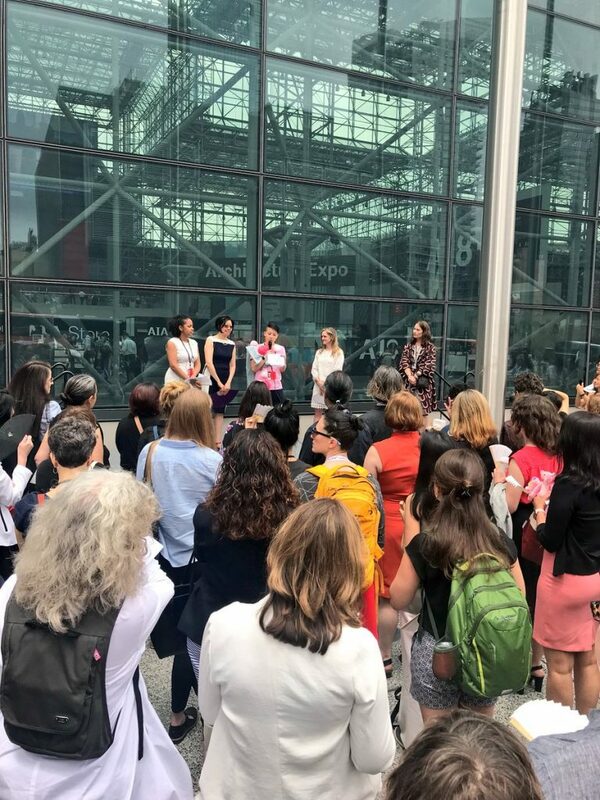 The group, which included men and women, senior leaders and emerging professionals, and architects of diverse races, orientations and backgrounds, gathered to raise awareness around issues of equality, equity and inclusivity in the architecture field. Before the crowd, speakers pushed for change and presented surprising statistics. For instance, did you know only 18% of licensed architects are women, and only 0.39% are black women? In other words, stateside there are just 433 living black female architects. During 2017’s AIA conference, equity became a major theme and was addressed by former First Lady Michelle Obama during her impactful keynote and during sessions like the EquityXDesign Hackathon. 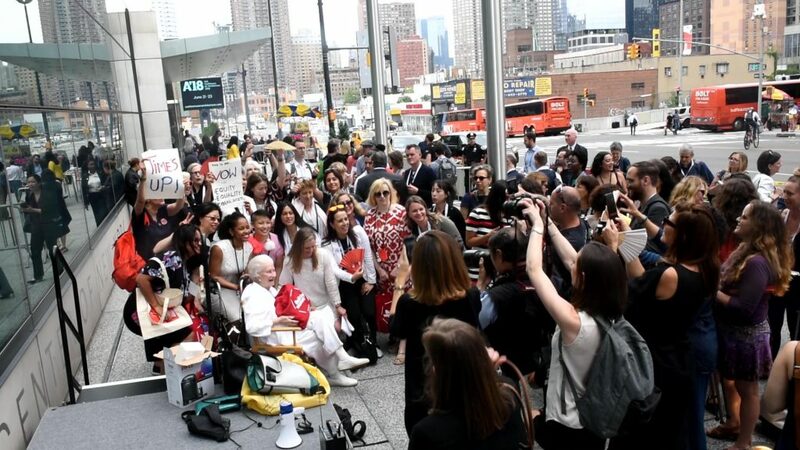 Since then, awareness around equity continues to surge with the Girl UNinterrupted organization surveying emerging professionals on their workplace experiences, the Young Architects Forum hosting Twitterchats to discuss the matter, and public reaction to architecture having its own #MeToo movement after sexual misconduct allegations surrounding Richard Meier emerged. 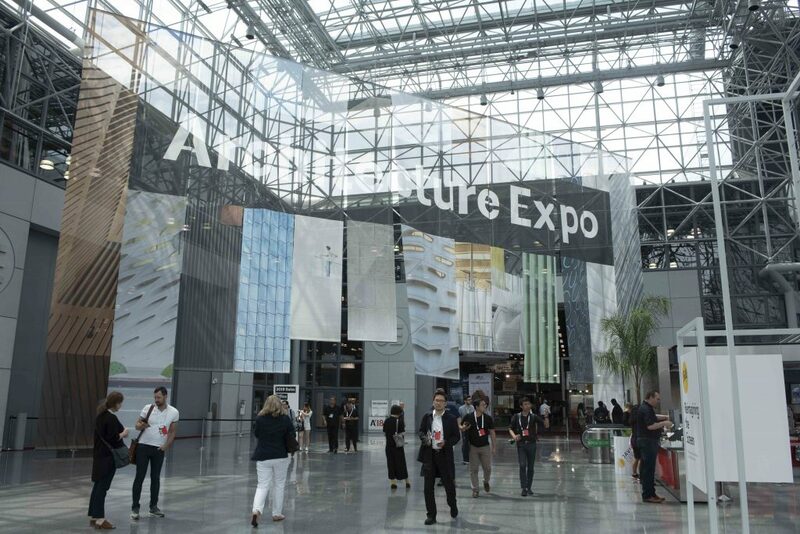 Of late, there’s been a strong push for change in architecture firm culture to better reflect the communities the profession serves by incorporating more diversity, and not only that, but also by ensuring that paths towards leadership are open to all. 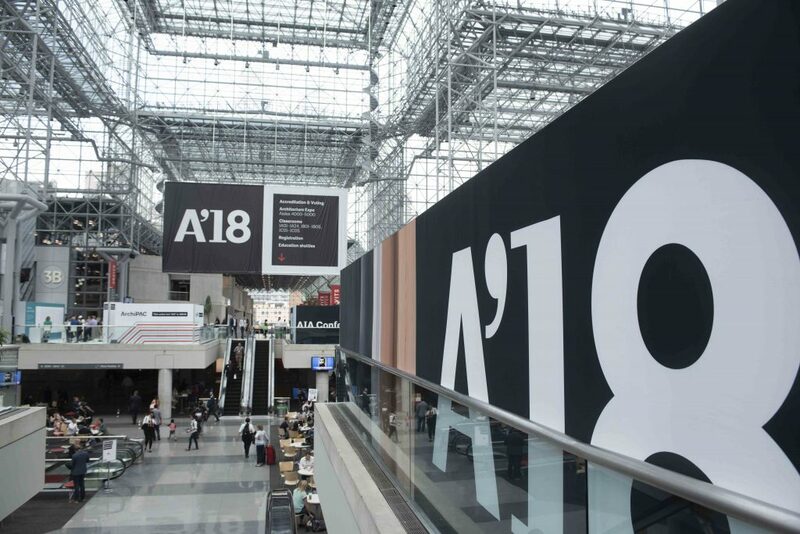 Just 11% of licensed principals and partners who run their own firms are architects of color — a jaw-dropping statistic that got the crowd going outside the Jacob K. Javits Convention Center at AIA during what participants called a “celebration” of voices, rather than a protest. 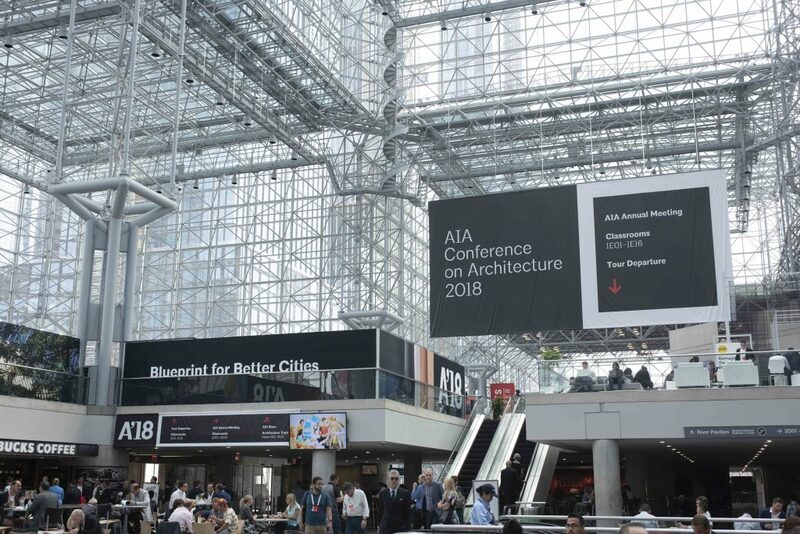 With awareness climbing, this month, AIA released an apology for an oversight in its selection of the Young Architects Award jury which lacked diversity and featured an all-male roster, which some social media users were quick to call out. The jury has since been changed. In the op-ed, Gang calls on her colleagues to utilize math-based assessment tools to find out where they truly stand in terms of issues like a gender pay gap, before making necessary changes. Similarly, Girl UNinterrupted, steered by Zhanina Boyadzhieva and Juliet Chun, designers at Leers Weinzapfel Associates, undertook a quantitative-based initiative with an added qualitative-based approach in surveying young architects and designers and recommending solutions for change for the profession to build a stronger, more equitable future. Their ultimate goal is to bridge the gap between young female designs and leaders in the field. Girl UNinterrupted, which Hunter Douglas Architectural is proud to sponsor, surveyed 533 emerging professionals in Boston on topics like discrimination, self-confidence in the workplace, wage gaps, and work-life balance, then held conversations with female architectural leaders to seek their advice for young professionals. This June, the final phase of their initiative included publishing a manual gathering their findings, experts’ advice and perspectives, and tips for both leaders and emerging professionals to create a better firm culture. Boyadzhieva and Chun hosted a well-attended session on the topic during AIA, revealing their collected tips including the idea that architects must set aside time to self-reflect and ensure they’re clear on their own goals while firm leaders should offer regular performance reviews, also assessing how they themselves are doing, and be transparent about their expectations. After their thorough survey of the field, which they dubbed the “Boston Experiment,” the duo revealed their findings at AIA. For instance, Girl UNinterrupted asked emerging professionals, “Are you licensed?” The results of men and women who were licensed or working towards it was close, but the disparity of those not planning to pursue licensure (21% of women versus just 7% of men) revealed a great gap. Next they asked architects, if they weren’t planning on getting licensed, why not? The results revealed 66% of women said it doesn’t apply to their work versus 14% of men. While they found a balance of relatively equal pay at the early career levels, the gap widened after 11 years and on, when 86% of male architects earn $81,000 or more, significantly ahead of women. Click here to view the full results of Girl UNinterrupted’s survey. During the engaging Q & A that followed, several audience members encouraged Girl UNinterrupted to visit their cities and firms next to continue to survey architects’ experiences, close information gaps between leaders and younger professionals, and spread awareness on the profession’s challenges. One young female architect told the speakers, “This was a great presentation. I feel so energized by it… and want you to bring it to my firm in North Carolina.” The team is already planning to take their initiative to other major cities this year including Washington D.C.
To read more about pushes for equity in architecture during this year’s AIA conference, click here.